6. Update barstools - Black painted stools? 8. Update lighting. Current chrome lighting does nothing to enhance the kitchen. 9. I would not paint trim or cabinets. Thank you for all of the suggestions, everyone. We have decided the oak over mantle can be removed and will help update the room. I'm not sure yet if we will rework the mantle and oak surround or leave it and just replace the tile. If I leave the oak, I will definitely try the weathered, gray finish. I appreciate your taking the time to comment. Unless you are unhappy with the kitchen or you are selling your house for a million+, do nothing. It seems noone is ever happy with it. If you can add to the flow of the room or enlarge it in someway, add real estate like a walk in pantry, they will only say it is a gut job anyway. better to give like a $1000 at sale to do what they want. Plus whatever you do the style will probably have changed. Hope it is helpful, truly not meant to be negative. Your kitchen is very nice. You should select the color / style for walls, floor, counter , backslash and cabinets (including hardware) at the same time. They have to work together as a unit. At the very minimum, if you lightly sand, prime and paint your cabinets a very common white like BM White dove, replace the hardware, get a marble or granite look quartz counter (it will hold up a lot better and the color is more specific) and ceramic subway tile for the backslash (that matches the paint color) your kitchen will look significantly updated. You can do the floor last and many floors will match. Very few floors will look good with the honey oak. 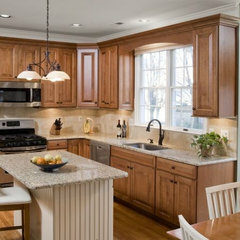 Honey Oak cabinets is like trying to update a living room that has wall to wall cream carpet. The cream carpet always brings it down a notch. jill are you drawn to any of the photos? 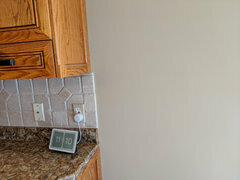 any counter top, wall color....anything? 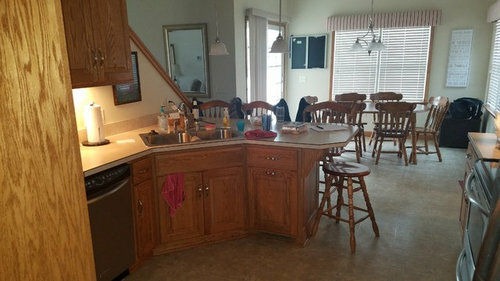 Personally, i love the creamy table and chairs, and also the last photo with the subtle counter top. Black counters would also look great. You could also go with something funkier like the black leather and chrome chairs. maybe its not the oak. looks like your counter tops are the old style. update those in a bright, or dark color. those can be painted also. and add a dash of color to your backsplash before you paint the oak. so you could also Only Replace Those Dated Cabinet Doors. nothing wrong with Hi-lo's if you have enough storage. use the above space for splashes of color. 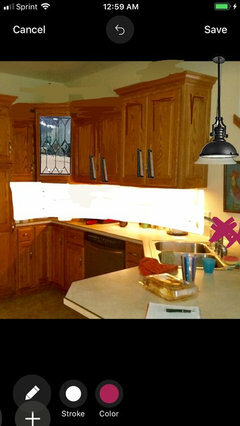 add rope lighting above and under cabinets. dont need to gut your kitchen. 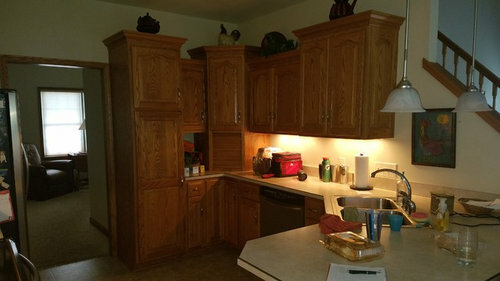 We have golden oak cabinets that we put in in the 80's that look very similar. We didn't go with the various heights or an appliance garage tho. We had very similar looking white counter top too. The cabinets are in very good condition and we have some oak elsewhere so it didn't make sense to replace them, cost wise or any other reason. We replaced the counters with Titanium granite. Black but with lovely swirls of caramel and off white. The caramel swirls complement the cabinets. It has also been very bullet proof with no maintenance, altho it was a fairly expensive granite. I see you already have UCL. We didn't, so added them as it was somewhat darker in there once we switched from white to black counter tops. We also added a small light rail that we stained and varnished to match the cabinets. That small addition just seemed to modernize the cabinets a bit too. We went with a neutral backsplash that didn't take away from the counter top. Got a new under-mount sink and faucet. Those changes made all the difference. Well, we got new SS appliances too, but I see you have those. And I replaced all the pulls with brushed SS ones. For your kitchen, if possible, I would remove the appliance garage as well. As someone else mentioned , it does make the counter look crowded. And you likely would gain space there, even if you do store something at the back on the counter in that corner. It would just open it up a bit. 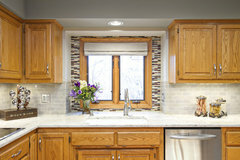 Get a new under-mount sink, new faucet and granite or quartz counter top. If possible I would also replace some of the spindled chairs. There do seem to be a lot of spindles. And as mentioned remove some of the ornaments from the top cabinets and maybe just keep one or two on a lower cabinet, or not at all. I think that would streamline and modernize your kitchen without a complete major overhaul. 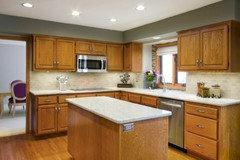 To get an immediate improvement, climb up and remove the dated decor from the tops of cabinets. All that stuff just emphasizes the disparity in heights. Spend half an hour finding a place for everything on the countertops. Ok. Now you will have a much better looking kitchen and you haven’t spent a penny! Down the road, new countertops, paint all that oak trim white, paint the stairs black or white, replace all chairs that have spindles. I dislike golden oak too and would be tempted to gut this to get rid of it. 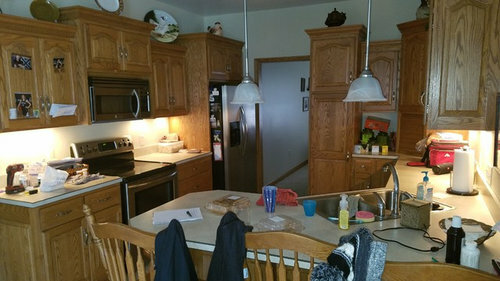 However, if you are happy with the layout and given that the cabinets are high quality, you might consider just replacing the doors. The arched style is almost worse than the golden oak to my eye, and an updated door style and hardware could really improve the look of this much less expensively than all new cabs. You could also consider new fronts for the base cabs and a complete replace of the upper cabs, which would allow you to get rid of the uneven heights and take them all the way to the ceiling, in a different color (white, probably), which would also lessen the oak factor. There is no ductwork hidden above the microwave, and I guess I never really considered getting an estimate on replacing those upper cabinets, making them taller and getting some extra storage. A hood there in place of the microwave would look amazingwith some tile work. The florring will be replaced . Thats what started this whole idea process. there is an outlet where the appliance garage is. Christopher thanks for all the pictures ! I like the funky sleek silver and black leather chairs, as well as the last picture. Do you like the counter in the last picture? what about red....i see you have in towels. btw, it looks great with oak. but tell us if you prefer another color to pop your kitchen. --Declutter before decorating--everything off the cabinet tops. Seriously declutter the interiors of your cabinets so that at least half of what is on the countertops can go inside the cabinets. --You have a double sink. Put a small dish rack in there along with your sponges, dish detergent, etc. Put the paper towels on a holder inside a lower cabinet. 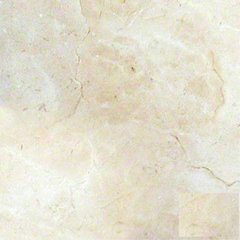 --Get creamy white quartz countertops. --You have so many spindly chairs. Replace the countertop chairs with white, modern chairs. --Paint the dining chairs white. Get panelled curtains for the windows instead of the valence. --Replace lighting over the peninsula with something more modern. Ditto in the dining area. Get undercabinet lighting. 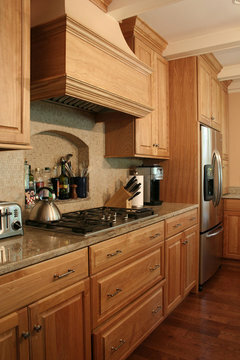 Here are some oak kitchens with upgraded hardware and fixtures. Go this direction. Notice the white chairs on the island and dining area with wood table. I would start over if it were me! If you dont mind the style of the cabinets (the fronts and such), you can get them spray finished or restained -- but that can almost be as expensive as replacing them. If you plan on changing counters, appliances, sink and faucet, backsplash etc, I'd say just get new ones that you like better! Countertops needn't be pure white but can be creamy white or a creamy white with a bit of gold pattern to bring out the warmth of the oak. Ditto backsplash. Match the wall color to the creamy white throughout the space. 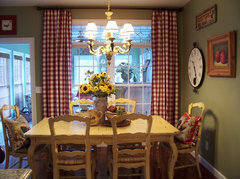 If you want more color, get patterned curtain panels in the dining area. I’d embrace the cabinet style for what it is. You can do an adorable and very well designed quaint farmhouse (not modern farmhouse) look with those cabinets. Golden Oak looks good with green. 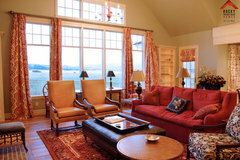 Paint walls green, get some plaid window treatments with green, red, and cream in them. 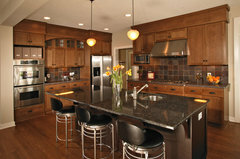 Replace countertops with cream or black, replace hardware with black or brushed nickel, and replace jewelry lighting. What you can change more easily than a gut job are the countertops/backsplash, lighting, lovely curtains, art, possibly a rug, painting the walls in all the adjoining spaces a creamy white so you get the flow. Paint your chairs the same white. These changes will greatly enhance your open spaces, the trim, and the existing cabinets. But have an overall plan for the changes so they all work together. I'm looking at your flooring. In the photo at least, the color looks fine. You could add a rug in the dining area or possibly your living room area if the kitchen also opens to it--something in creams and golds. Also consider in the dining area, to the right and left of the window some art work in tones and subjects your like that work with your wood trim. First you need to say what you don't like about the oak cabinets. Is it the wood, the color, the style? They appear to be well made and sturdy. From what you said, it sounds like it's not necessarily the cabinets that bother you, but the fact that your house has other oak (like the captain's chairs and the banister) and there's just too much of it. Have you checked to see if the Amish company that made your cabinets is still in business? If so, you might think about having them redo certain aspects of the kitchen, without redoing the whole thing. For example, the cathedral style upper door....change to a square style door. Or you can change all the doors to a more contemporary looking oak species and style (rift, quartersawn). You can leave all the frames as is (if you like your layout) and just change out the doors. You can change the crown molding to a more contemporary look. Definitely change the door pulls. You need to decide what you want to accomplish and what you are willing to spend? Also, important when you redo your kitchen is you want to make sure that it's appropriate to the style and value of your house. 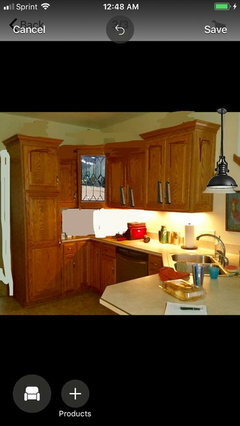 You can paint your oak cabinets...it just requires a lot of painstaking prep work and can be expensive unless you DIY. You don't want to DIY unless you are an obsessive person because you would have to be meticulous. Or you can donate your kitchen to Habitat and start fresh. You really can't start designing until you know what direction you want to go in and how much you want to spend. So start by pinpointing what you want to accomplish (usually what you want to change) and how much you are willing to spend to accomplish it. Your backsplash is really important as is the counter. so try and decide what counter top you want. go to the fabricator (not a big box store, their samples are too small) take a small door front with you. Quartz will be the best for your home. make sure 1 1/4" min. depth. (Price will be less than big box) Try black speckled or small patterned with some color of your actual cabinet. Start there. make that decision, then tackle the back splash. Jill, I would steer you away from a red/green/yellow palette. Especially keep away from gold in your decor. Those colors were trending in the 90’s and that’s what you need to step away from. Black + white+ wood is currently trending. I would go in that direction for a fresh look. Amanda those colors are classic with oak, They live well together. They are not 90's. It is how you use them that is important. Yes black will work well, but splashes of those colors are what this room needs. Jill wants to downplay the oak and white and creams aren't strong enough to balance it. Certain shades of any of the following: Gray, Blue, Gold, Red or Green will be awesome. They will balance the oak. 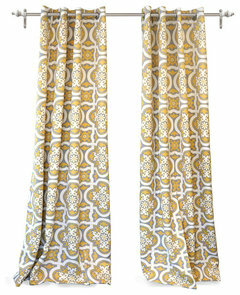 A cream dining suite would work with focal side drapes. just my thoughts. Trends will be gone in a few years..true design style will last. I’m seeing a lot of design advice here that’s back to the 90’s! Here’s a fresh look that you might consider. If you want to keep most of this kitchen then have the uppers redone. Lose the arch top door style with replacements, raise the shorter boxes and add a glass door to some for a bit of light and relief from all the wood. New countertops, under mount sink, new lighting, new paint color! Paint all your oak trim white! You have enough with the cabinets! Get new furniture that doesn’t have any oak and is more contemporary! New hardware too! Black accents. 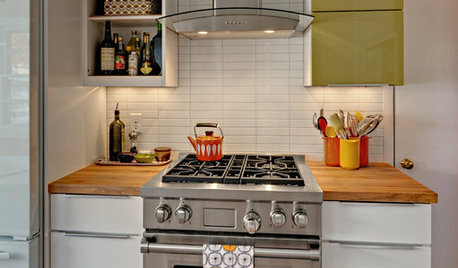 Oh, and loose the appliance garage, and add a proper, light colored backsplash! 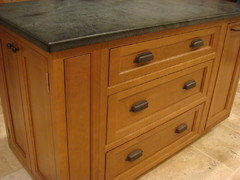 What about cup drawer pulls and darker counter top? I know it is a bit rustic but you said to throw things at you. Check out jhmarie who posted here. She calmed me down this morning. I have the same dilemma. After looking at her idea book I'm rethinking it. I think we can maybe fall in love w/our homes again. Good luck. 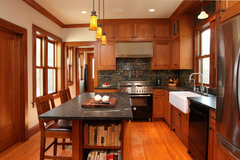 Here's jhmarie's Ideabook called Warm Wood Kitchens for folks who may want to reconsider throwing out or painting well-made, rich, wood cabinets: There are many creative ways to modernize and upgrade a kitchen that has warm wood cabinets: modern lighting, under cabinet lighting, light countertops and backsplash, art work, painting just the kitchen island. Hello Jill. 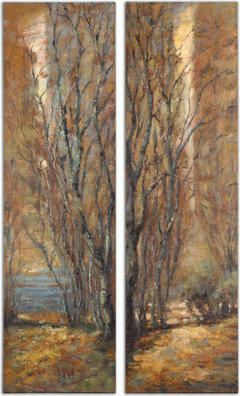 maybe take a look at Ben Moore Bleeker Beige or a shade darker for your walls. Think that will mellow out the gold. There are some great champagne colored hardware items on the market now. yes black will work, but that medium tone is newer and different from all the black and grey that has been around for too long. I live surrounded by woods so I guess my thought was to stay away from darker tones like reds since my kitchen is darker to begin with and go maybe towards the lighter colors like the whites this time to help brighten it ?? Am I wrong for thinking this way . Will you hop over to my post about "Advised not to paint cabinets due to using Pledge on them" from 3/15/19. Look at my pics. I love your advice to Jill. Maybe u can guide me? I do like BM Bleeker Beige...however I would be careful not to go into gold tones. You would just end up with more of what you don’t want. Personally I'd stay away from too much red-beige-orange too. A different countertop and another dining set will get you quite far. Especially if you're fine with your kitchen layout, a new countertop (+sink+tap) might be a good investment. And, in my opinion, you could keep the oak doorframes and baseboards and just paint the window frames. Hi Jill. I think if you go with lighter you will be disappointed as it will make the oak more prominent than necessary and be very similar to what you have now..
would you consider purchasing a can of paint and trying benjamine moore- bleeker beige in one area. or a large sample board. What are the colors in your rooster? 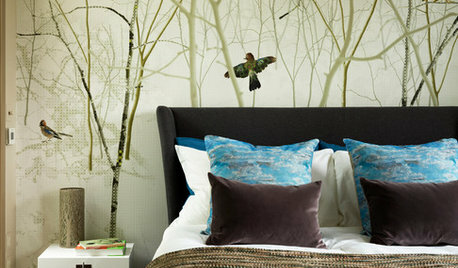 Keeping your accents to a couple of colors will also help calm your room. You also may require more ceiling led pots. Punching up your backsplash is also important. That will really change your room! You might also consider a painted creamy white table and chairs..this will give you a focal point that is lighter. and large champagne colored amazing light fixture. Too often we choose off white as we are afraid to commit . I understand that and know how to balance color in a room. Accents can be changed easily. I am not suggesting red walls, only for a few accent items. 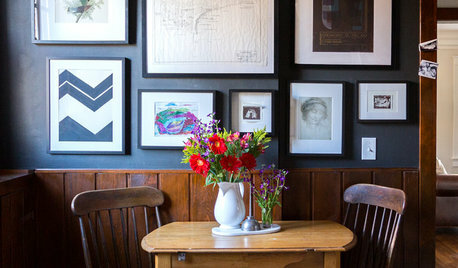 We need to give you the color accents in the dining area and with art. I prefer a room that can be color changed with the seasons while keeping the main background calm unless I am asked for high contrast spaces. I also live with nature...nothing better for the soul! Lucky you. So my question for you: do you like high contrast or calm with accents? What accent color would you be comfortable with? How do you feel about a lighter table? How do you feel about bleeker beige walls? GeorgiaPeach 1970could you send me the link? 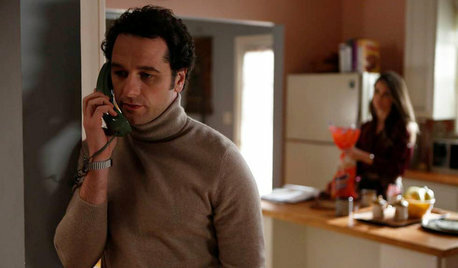 Christopher-I would be open to the BM bleeker beige. Also the creamy white table and chairs. I would probably prefer calm with accents, My rooster which my son made in school several years ago has red purple blue orange and yellow colors. Christopher-Love the idea book !! The pop of color definately drew the eye away !! I am drawn to the darker counters or at the very least a mid tone. Glad you like the idea book. Lots to consider. Mid tone counter would be my choice. but darker would also work, depending on what you are leaning towards for your floor. you will need to consider your adjoining flooring. I've seen no posts about painting those oak cabinets. Oil based furniture paint does WONDERS on cabinets. Don't be afraid to do it. I'd also be more in favor of refinishing those cabs than painting, if it came to that. Whether the more natural oak look Christopher posted above, or something just a bit darker (without being too red or back to gold). Natural wood is lovely. You're just a bit overwhelmed by the color of the finish, I think. And it's feeling more brash because trends have gone so far to the grey. Things are swinging back, but try to stick with something more neutral for this refresh and you'll still love it in another 15 years. I actually like the look of golden oak paired with whites (not stark white, but only slightly creamy white). 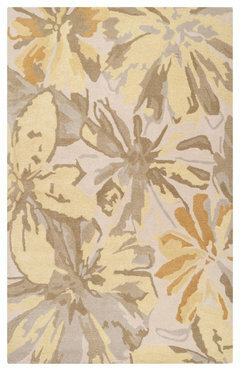 I think that when it is paired with beiges, tans, and browns it just makes the entire room tired and dull. Different strokes! To pull it off takes careful selection of the whites and also the accent colors. But a glowing, cheerful golden oak can be showcased and look wonderful -- it is the surrounding colors and designs that date it or become too much, IMO. I would change the nickel fixtures and pulls to a darker finish. 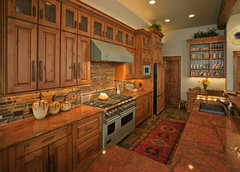 We also have an oak kitchen, although it's a little darker and more orange than yours. We have Bleeker Beige on the walls. We bought this house a few years ago fully expecting to overhaul the kitchen, but the cabinetry is higher end and super solid and it's growing on us. Bleeker Beige was the color selected by the previous owner, so we really haven't done a thing. We are definitely replacing the pink travertine backsplash this summer, although now that I've ready Lily's thread, I may just paint it! I am thinking to do a creamy white or bone color. 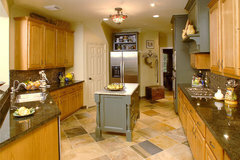 The countertop is Cambria quartz in Buckingham, and the pulls and fixtures are ORB. our walls were painted a light latte, and was nice. 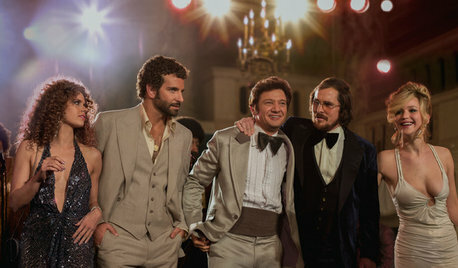 DECORATING STYLESThe '70s Are Back. Can Ya Dig It?